Description: HLCX 6253 leads a Union Pacific tunnel motor on CSX Q327-27 through East Lansing. 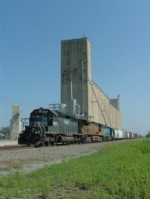 Description: Southbound manifest on the UP Jonesboro Sub is dwarfed by the large rice silos in Weiner Arkansas. Description: A colorful consist leads a southbound manifest on the UP Jonesboro Sub. Description: Old power galore, as a unit grain train chugs eastbound from Big Bend Tunnel. Description: HCLX a su paso por Colima, Mexico.